Mine protected vehicles are routinely required to meet mine protection levels set out in specifications (eg. STANAG 4569). The process involved in obtaining certification for a vehicle according to these specifications can be costly and time consuming and become especially painful if a vehicle fails to provide the desired level of protection during testing. 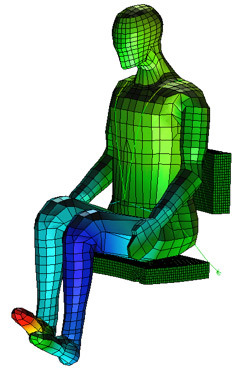 If simulation is used competently, it can decrease the chances of failing certification tests. This can provide a decisive advantage over competitors because it will not only reduce the development cost of a vehicle, but ensure that the vehicle performs more reliably in the field than would otherwise be the case. Simulation clearly has some very attractive attributes, but it is prudent to note that it is not a certification tool. It is a design tool. Simulation provides representative response information that allows informed design decisions to be made. The aim of performing mine blast simulation is to reduce the amount of physical testing required, not eliminate it. Having established the motivation for using simulation in the development of mine protected vehicles, the approach and software used to perform these analyses merits discussion. This will be the topic of the next blog article titled “Performing Vehicle Mine Blast Analysis”.